A few readers characterized the crisis I foresee as being a repeat of the 2008 fiasco. That’s partly right, in the sense we will have a painful economic and market downturn, but the causes will be quite different. Last time around, the root problem was excessive residential real estate debt. Reckless lenders made unwise loans so unqualified borrowers could buy overpriced homes. These loans morphed into securities and derivatives and all blew up. I don’t think it will happen that way again. The next crisis will spring from corporate debt, equally imprudent but structurally different. This train wreck will be similar in one respect, though. The first defaults will occur at the lowest end of the problematic market: high yield or “junk” bonds. They will play a role comparable to subprime mortgages in the last crisis. We’ll see mortgage problems as well, but I think overleveraged companies will be the core problem. Before we go into that, you might want to review prior installments in this series or read them first if you’re just now joining us. 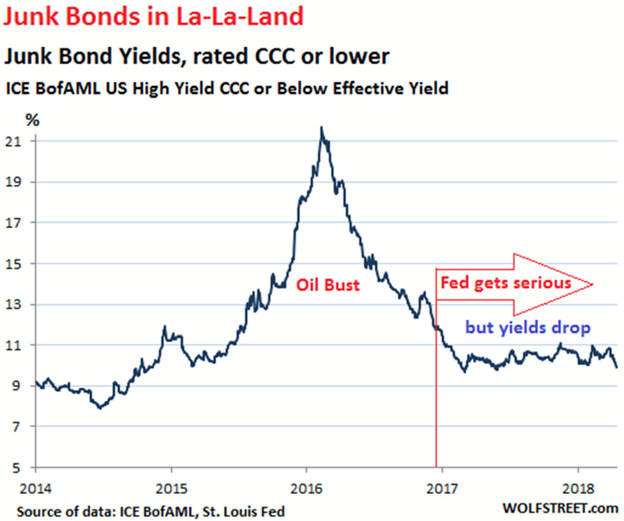 Today, we’ll look at a not-so-prime example of the reckless investments people are making in high-yield bonds, then consider how big the problem can get. But we’ll start with a little history. Older readers will remember a Houston-based company called Enron that blew itself, its employees, and investors to smithereens during the 2001–2002 recession. Investigations followed. Some management (properly) went to prison. In the late 1990s, Enron engaged former Reagan speechwriter and Wall Street Journal columnist Peggy Noonan to help explain itself to the world. Noonan, possibly the greatest business writer of her generation, couldn’t do it. She described the experience in a 2002 column. Enron wasn’t entirely vaporware. Those people Peggy Noonan saw really did trade electricity. Before the collapse, it spun off a subsidiary called Enron Oil & Gas which survives today as EOG Resources, a major shale player. But most of the dreams went nowhere, disguised by accounting fictions that eventually fell apart. This is all obvious now. Back then, it wasn’t. Intelligent, seasoned investors believed Enron really was “the future!” and gave it their hard-earned money not only for equity but for debt. Lots of debt. Enron's bankruptcy filings showed $13.1 billion in debt for the parent company and an additional $18.1 billion for affiliates. But that doesn't include at least $20 billion more estimated to exist off the balance sheet. I’ve talked about potential problems in the high-yield bond market. That’s the polite name for “junk” bonds, issued by companies that can’t earn an investment-grade rating even from our famously lenient bond rating agencies. This is a two-layer threat. First, many of these companies are so marginal that even a mild economic downturn could render them unable to make bond payments. The second layer is that bondholders will want to sell those bonds, but the liquidity they presume probably won’t be there. I could point to many examples, but we’ll take one that was in the news recently: WeWork. The still-private company issued bonds last month, giving the public a peek into the books. The offering raised $702 million at 7.875%—a nice yield if it lasts the full seven-year term. That is if you get your capital back at the end of those years. I’m not convinced investors Will. WeWork, at least, has a clear business model, one proven by other companies, and they are executing with panache and flair. It signs long-term leases for office space, then subleases to the hordes of freelancers and independent contractors who need an inexpensive workspace. Much of it is just tabletop space in open suites. This is apparently attractive to the younger set who like being close to peers, and the price is certainly right. WeWork provides all sorts of amenities which create an enjoyable workplace. Founder Adam Neumann is a charismatic executive who’s obviously adept at raising capital. So, it could last for some time. The risk is that WeWork’s renters could disappear quickly if their own income dries up, as will happen for many when the economy breaks. Investors seem to believe this risk isn’t just manageable, but negligible. After walking through the numbers and comparing WeWork’s current $20 billion valuation with comparable companies, Grant says investors have essentially gone insane. The list of investors’ concerns around WeWork belong to a bygone era when those lending a company their precious capital (and foregoing a risk-free return) used to require that company’s assets and liabilities bear some relationship to each other. Negative cashflow also used to be ‘a thing’ and ‘strategic challenges’ once raised an eyebrow or two. Instead, in a world of yield-seeking and minimal due diligence, the combination of a (relatively) juicy yield and the appearance on a company’s register of superstar names like Masayoshi Son is all that’s required for what once counted as material aspects of a company’s business to be forgotten. If, instead of merely subleasing 14 million feet, WeWork owned 14 million feet of office buildings at a valuation of say $500 a foot, the company would be worth $7 billion or roughly one-third of its self-touted value. And that $7 billion valuation would presuppose owning all of those buildings free and clear of debt. McNellis also highlights something important from the bond disclosures. WeWork neither signs nor guarantees its own leases; rather, for each lease it signs, it creates a single purpose entity [SPE] with very limited capitalization; i.e. its leases carry almost no financial exposure to the parent company. These entities are known as SPE’s (“Screwing Probably Expected”). So, if WeWork’s renters disappear, the first victims will not be WeWork, but the property owners who leased space to WeWork. They may have little recourse. But they’re probably leveraged themselves, so the losses will flow upstream, eventually to the banking system. And we know where that ends. Here’s the truly scary part: WeWork isn’t unusual. The landscape is littered with similarly tenuous corporate borrowers. It is the inevitable consequence of a free-cash decade. Here’s Grant Williams again. WeWork is one example of a company for whom, in the face of rapid growth, massive negative cashflows aren’t a problem, but there are plenty of others. Uber, AirBnB, SnapChat and, of course, Tesla have all captured the imagination of investors thanks to lofty dreams, articulated by charismatic CEOs—but the day things turn around and the economy begins to weaken or, God forbid, investors seek a return on their investment as opposed to settling for rolling promises of gigantic, game changing revenues to come, it is over. Look, I’m all about “lofty dreams.” I have them myself. I admire entrepreneurs who take risks and break new ground. They are the key to economic growth. Building a business is the single best and most effective way to create personal wealth. But it’s also true that most of those dreams are simply dreams and will never come true. A few who bet on them win big, but most lose some or all of their investment. Adam Neumann at WeWork has convinced investors that his office space rental company should actually be viewed as a technology company. We are creating a “community” he says. Whatever that is. There is a successful and larger competitor whose valuation is roughly 10% of WeWork. But then, they are in the office space rental business, not the “creating a community/building the future” business. A long line of businessmen and women seemingly have the gift to convince investors to buy unrated paper that is unsecured with no assets behind it. The problem is that unraveling dreams tend to be contagious. Investor psychology is fragile, so the collapse of one high-profile dream can bring lesser-known ones down, too. I think we’re approaching that point. Yet something interesting and a little counterintuitive is happening. You might think the yield on bonds issued by risky companies would rise as the cycle matures. That would be consistent with investors demanding more compensation for their risk. But it hasn’t happened that way. After spiking higher during the 2015–2016 oil bust, when many shale drillers had serious problems, yields dropped in 2017. Not by coincidence, that’s also when the Federal Reserve began hiking rates every quarter. Fearing capital losses, Treasury investors relaxed their credit standards and created more demand for junk bonds, which sent those yields lower. That’s my theory, at least. We’re seeing classic end-of-cycle behavior: throw caution to the wind and plunge capital into the market’s riskiest corners. This artificially-induced buying is propping up companies that would otherwise succumb to the fundamental forces arrayed against them. Nor is it simply a junk-bond problem; the investment-grade corporate market is becoming measurably riskier. Here’s a Dave Rosenberg chart that my friend Steve Blumenthal shared recently. 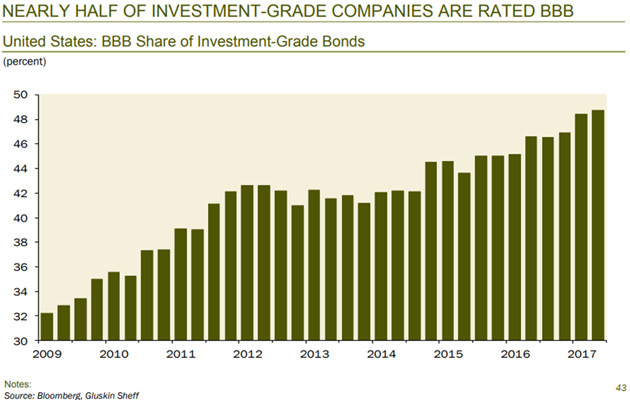 Almost half of investment-grade companies are rated BBB, just one step above junk, up from just one-third in 2009. When the economy breaks, some of those companies will run into trouble. Some of those will get downgraded, which will force many funds to sell them, thereby intensifying the liquidity storm I’ve described. A few companies will probably default. Bondholders may have little recourse to recover their principal, having accepted covenant-lite conditions and taken on leverage themselves. 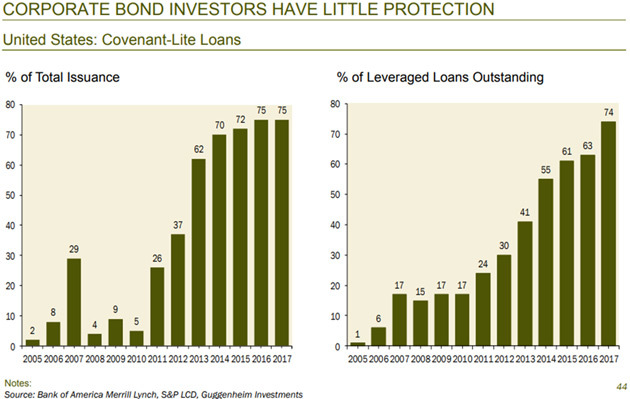 Leveraged lenders will be in a pickle when the defaults begin, but they won’t be the only ones. It all flows downstream. Whoever extended credit to leveraged loan buyers will be in trouble, too. That’s how problems in one market spread to others. Let’s explore what we mean by the term covenant lite. Borrowers can become extraordinarily creative. Some covenant-lite loans let the borrower repay with freshly issued debt—in essence, printing their own money. Others allow them to borrow even more money, perhaps pledging assets that should have gone to the company, in order to let the firm’s initial private equity investors pull out equity. This effectively transfers additional risk to bondholders. The closest comparison I can imagine is the dot-com run up to 2000, and the debt is still growing. While high-yield bond issuance dropped somewhat over the last few years, leveraged loans at the same companies are up 12% since 2014. There is a lot of overlap in the companies that issue high-yield bonds and issue debt (loans), and it is no coincidence that the rapid increase in leveraged loans has coincided with a period of decline for high-yield debt. Since the end of 2014, the US high-yield market has shrunk by 3.7% while the loan market has grown by 12.7%. In aggregate, the combined size of the US loan and high-yield bond markets has been broadly stable since 2014 (chart 2). Again, this is very different to the wave of mega-leveraged buyouts (LBOs), which expanded the high-yield and loan markets in the 2005–2007 period. My data sources show different amounts of high-yield bond issuance, but all show a lot of it. Looking at just the Morningstar high-yield category, I see $1.4 trillion in mutual funds and almost $650 billion in high-yield ETFs. Some of these funds are well-managed and some are so large they buy anything (maybe including WeWork) because they need to invest their incoming cash. Those numbers don’t count high-yield bonds held outside of funds and ETFs. 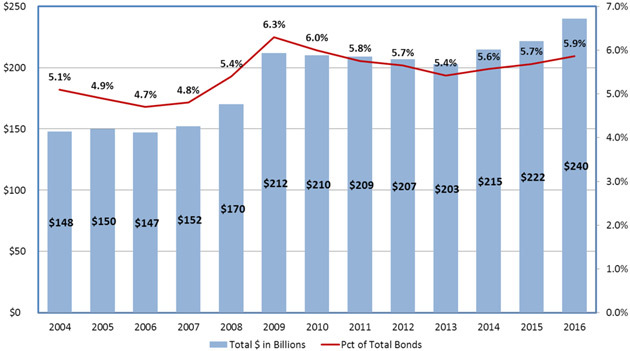 As this National Association of Insurance Commissioners chart shows, the insurance industry has $240 billion worth of high-yield debt which represents 5.9% of their total bond investments. Then there are pensions, foundations, and endowments that have their own exposure to high-yield bonds. The difference is (this is a big generality) institutional investors are typically buying specific bonds, so they don’t quite get the exposure to some of the extreme jumps. Further, they can hold to maturity, making liquidity less of an issue. The roughly $2 trillion in high-yield bond funds and ETFs get marked-to-market every day. This means individual investors can see their values go down as well as up. If losses make enough of them begin to withdraw, it will force those funds to sell into a shrinking market, putting further pressure on valuations. In a plunging market, you don’t sell what you want, you sell what you can. Funds have to meet redemptions. That means increasingly lower-rated bonds remain for investors who don’t move early. Valuations drop and it just cascades. A decade ago, we saw a subprime mortgage debt crisis bleed into the rest of the markets. I think this time, the high-yield debt crisis will have the same result. Next week, we will look at The Second Act. Later on, we’ll get to emerging market debt and perhaps even worse, the non-corporate grade bond market in Europe—and don’t get me started on the problems in China. This is a long story and we’re still at the beginning. Shane and I are mostly home for the summer, where I intend to spend more gym and writing time. At some point, we will take a quick two-day trip to Cleveland to go through the Cleveland Clinic’s executive health checkup program with our friend Dr. Mike Roizen. We are trying to arrange a few other meetings there which has the schedule unclear at this point. In August, I will take my traditional Camp Kotok fishing trek with many friends and my youngest son at Grand Lake Stream, Maine. 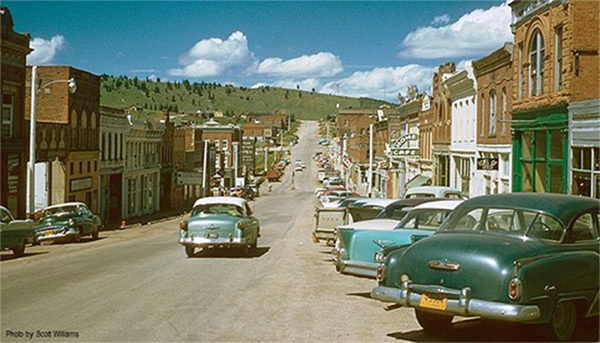 Later that month, Shane and I will go to Beaver Creek, Colorado for an Ashford board meeting. We also plan to visit Woody Brock at his summer home in Gloucester and then drive down to Newport, Rhode Island to spend a few days with Steve Cucchiaro and his fiancée, Jama, on their catamaran. That’s actually a pretty relaxed travel schedule for me. This weekend, some of the clan will gather as Amanda Mauldin Porter, her husband Allen, and their two young daughters (my granddaughters) will be here from Tulsa. Much of the rest of the family will come by to see them. Much is happening in my business and writing life that I will be able to talk about in a few weeks. It should “buy” me significantly more time each week to do what I like: reading, research, writing, and thinking. That will hopefully improve the letters and other research. Maybe it will even open some opportunities for you. We will see…. It’s time to hit the send button. I have committed to finishing the letter much earlier each week, so it can reach your inbox early Saturday morning. This has forced me to completely rework my life schedule, but after being in the rhythm for a few weeks, I realize how much more fun (and productive!) I am without a deadline hanging over me. My partners have urged me to do this for years, but I couldn’t get out of my scheduling rut. They finally presented irrefutable data showing I needed to finish earlier, so I rescheduled my life. Best thing I’ve done in a long time. “THIS COMRADE IS politically reliable and has no criminal record.” Applicants for a Chinese passport once anxiously awaited these words. Scrawled on a form by a bureaucrat, they meant an end in sight to weeks or months of torment that involved queuing through the night, being sent from pillar to post in pursuit of documents, having your loyalty to the Communist Party checked, being grilled about your purpose and sources of funding, and having to slip cigarettes to sullen officials. Not many people got to see those precious words, or the four Chinese characters that followed them: tongyi chuguo (permitted to go abroad). Aspiring travellers in Communist-ruled China had to run this Kafkaesque obstacle course until the early 1990s. But in the past quarter-century a country once almost as paranoid as North Korea about keeping its people within its borders has dramatically changed course. Whereas for much of the 1980s the number of trips abroad taken by Chinese citizens was in the tens of thousands a year, the current figure is well over 130m. The reasons for travelling range from tourism and study to business and migration. By 2020 the total could reach 200m a year, officials estimate—the equivalent of nearly one in seven of the country’s population. Much has been written about how China’s rise as a global economic, political and military power is changing the world. This special report is about another side to the story: the extraordinary number and variety of Chinese people who are going abroad—and then mostly returning. It will examine the effect of this unprecedented flow on the travellers themselves, on their host societies and ultimately on China itself. Since the 1980s people have been moving around the globe in ever-growing numbers. The reasons have ranged from the collapse of communism in the Soviet Union and eastern Europe and the opening of borders in the European Union to the growth of middle classes across the developing world and the flight of millions from conflict and poverty. But China’s contribution to this mass movement has eclipsed all others. Its people are making a striking difference the world over. 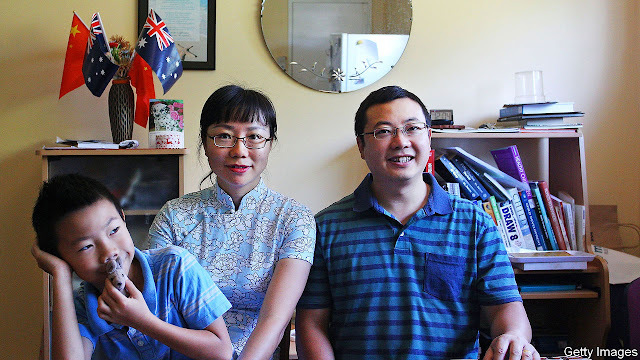 On university campuses in Sydney Chinese students fill lecture halls and research labs. In California’s Silicon Valley Chinese scientists make up a big share of tech firms’ brainpower. In the medieval Italian city of Prato thousands of Chinese toil in clothing factories. In small towns in Namibia Chinese traders peddle cheap wares. Big-spending tourists from China snap up luxury brands in Mayfair in London and the Champs Elysées in Paris. Forty years ago, when Deng Xiaoping “unfastened the great gate of reform and opening”, as officials often put it, it was far from clear that this would ever happen. Deng’s idea of opening was warily to admit some foreign tourists and businesspeople and, on an even tighter rein, journalists. He saw this relaxation as an economic and diplomatic necessity. A more normal relationship with the West, including visits by Westerners, was an essential salve for China’s Mao-battered economy. Deng also saw some benefit in sending more Chinese students to universities abroad to acquire technical know-how at state expense, but he never envisaged an outflow on the scale seen since. “There are those who say we should not open our windows, because open windows let in flies and other insects,” Deng reportedly said in 1985. “But we say, ‘Open the windows, breathe the fresh air and at the same time fight the flies’.” As it turned out, swatting insects took up a lot of his time. Fortunately for China, the Communist Party was sometimes prepared to take risks. This was evident in three main areas. The first was reforming the economy. In the 1990s leaders ignored the complaints of conservatives and pushed ahead with the closure or sale of tens of thousands of state-owned enterprises. With the rapid growth of private business, the shift of many state employees into these new jobs and the migration of tens of millions of people to find work in cities, the party lost much of its once all-controlling network of workplace cells (it is still struggling to build a new one). But the reforms helped to catapult China into the ranks of global economic powers. The second big risk was taken by Deng’s successor, Jiang Zemin: embracing the internet. Mr Jiang may not have realised in the 1990s how much this new technology would change the world (who did?). But it was still a gamble for a party that was determined to control the spread of information. And it paid off: China became a global leader in information technology, and the party remained in power. The third gamble was to open the country’s gates and allow people to leave. The exodus started haltingly but steadily gathered pace. Since 2007 the number of visits abroad made by Chinese people has more than tripled. To cash in on China’s tourism boom, many countries have greatly eased their visa requirements. Some have also opened their doors to rich Chinese migrants by giving them permanent residency, at a Price. For many people in host countries, the growing presence of Chinese people is a bonanza. But it is also fuelling resentment, sometimes tinged with racism. Residents of Australian cities fret about soaring property prices, which they attribute to Chinese demand. In parts of Africa people grumble about competition from Chinese shopkeepers or construction firms. Italians sound off about a perceived threat to their textile industry from Chinese migrants, many of them illegal. Political and security fears come into the picture, too. Across the West concerns are growing that universities rely too heavily on fee income from Chinese students, exposing the institutions concerned to the risk of espionage in high-tech labs and ideological interference by the Chinese state. In February the director of America’s FBI, Christopher Wray, called China “not just a whole-of-government threat but a whole-of-society threat”. Noting the activities of what he called China’s intelligence “collectors”, he said that “it’s not just in major cities; it’s in small ones as well. It’s across basically every discipline.” Some governments worry that having millions of its citizens abroad will encourage China to boost its military power. Western politicians might show more enthusiasm about this wave of Chinese visitors if they thought that the travellers, once returned home, would transform their country with liberal ideas they had picked up abroad. But evidence of this is scant. As Xi Jinping, China’s leader, clamps down ever harder on civil liberties, flexes his muscles in the South China Sea and squeezes foreign firms for intellectual property, a more global China does not seem to be getting any easier for the West to deal with. And for its people, familiarity with Western ways appears to be breeding mainly contempt. Yet this report will argue that it is far too early to assess the full impact on China of this large-scale movement of people. It will look at the tens of millions of Chinese tourists who are flocking to Western countries every year and sending back images and accounts of their impressions to countless millions back home; the hundreds of thousands of students who head annually to Western universities for their first taste of intellectual freedom; the tens of thousands who head abroad to eke a living in factories, shops and restaurants (and dream of making a fortune); and the hundreds of thousands of wealthy Chinese who shuttle between two rich worlds—the affluent suburbs of Western cities, where they snap up expensive properties, and the boomtowns of China, where they fill boardrooms. Travellers returning from abroad, and the ideas they bring with them, have played a crucial role in the country’s tortuous history, especially since the 19th century. The recent flow has been greater than anything seen before. In the long run, Deng may turn out to have been right to worry about political flies. No U.S. president has been as loathed. But the Continent knows it still needs America. The trans-Atlantic relationship is in trouble. No American president has ever been as widely loathed among Europe’s political class as Donald Trump. And not since the era of Freedom Fries and Axis of Weasels have so many European countries, this time including Britain, been spoiling for a fight with the U.S.
To the Europeans, Mr. Trump’s decision to withdraw from the Iran deal and impose sanctions on European companies that trade with Iran is a profound betrayal. As they see it, the U.S. made a solemn commitment to observe the deal after European countries entered into it in good faith. Harming European commerce with Iran to serve American interests is the act of a bully and an overlord, not of an ally and friend. The Trump administration’s apparent indifference to European concerns boils the blood of even the most placid of Eurocrats. Europe is now actively looking for ways to inflict pain on the Trump administration in the short term, and in the long term to ensure its increasing independence from the U.S.
From the White House, things look very different. The Iran deal was not a legally binding instrument but the result of President Obama’s overreaching freelance diplomacy—as if Woodrow Wilson, counting the votes against the Treaty of Versailles, unilaterally committed the U.S. to join the League of Nations. The Europeans should have checked the relevant clauses in the American Constitution, assessed the state of congressional sentiment, and realized that Mr. Obama simply lacked the authority, political or constitutional, to commit the country permanently to such an agreement. For the Trump administration, the Iran decision was not about deserting allies or overruling their wishes. Mr. Trump’s Middle East policies, after all, are quite popular with most of America’s Middle East allies. The Gulf Arabs and Israel felt betrayed by the Obama administration’s pivot to Iran; they are thrilled about the American change of course. The question isn’t whether the U.S. should stand by its allies but whether the Middle East policy preferences of America’s European allies should be imposed on those allies that actually live in the región. The suggestion that their wishes must be weighed against those of the Gulf Arabs and Israel is humiliating to European policy makers. Most European governments do not regard these postcolonial Arab monarchies and Zionist upstarts as anything near their equals. For a U.S. administration to take that view is a slap in the face. But preventing a single power from dominating the oil resources and transportation routes around the Persian Gulf has been a central objective of American policy since the Truman administration. Iran is currently the largest, indeed the only, significant threat to these vital interests. The maintenance of the U.S. power upon which America’s European allies rely, the administration believes, depends on blocking Iran’s drive for regional primacy. From this perspective, it seems arrogant of European countries to so casually brush aside the claims of longtime U.S. partners like Israel and the Gulf Arab states, and ridiculous of Europe to demand a veto power over actions the American government believes are necessary to the preservation of the global system. 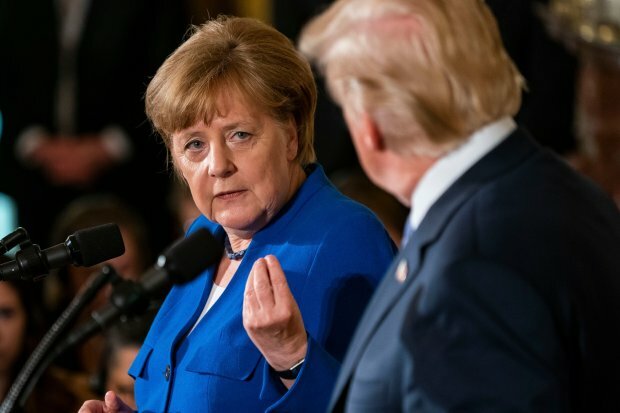 These strategic arguments cut no ice with Europeans, largely because Europe has lost all faith in the strategic coherence of the Trump administration. Most European policy makers believe the Trump administration is too impulsive and divided to develop a workable Iran strategy. They see its exit from the Iran deal as an irrational and self-defeating outburst of rage, not part of a coherent regional plan. The Trump administration, for its part, thinks Europe’s position is driven more by a short-term hunger for export markets in Iran than by any workable strategy for a stable Middle East. Despite these troubles, Europe and the U.S. still need each other. Europeans, including Germans, can sound almost Trumpian when they criticize Chinese mercantilism, which they share with the U.S. an interest in countering. The deep economic integration between Europe and the U.S. helps underwrite global prosperity. Intelligence cooperation against jihadist criminals is, if anything, more important to Europe than to the U.S. And a host of external threats, from Russian revanchism to uncontrollable refugee flows in the Middle East and Africa, continue to remind Europe of its need for friendly allies. The problems in the relationship are likely to persist for the foreseeable future. Mr. Trump will go on being Trumpian, and Europe will go on being European. One important test of Secretary of State Mike Pompeo in his new job will be whether he can protect essential U.S.-European cooperation from the political turbulence ahead. ITALY’S president, Sergio Mattarella is expected to decide on May 30th whether to call a snap election as early as July in an effort to resolve a rapidly deepening political and economic crisis that has sent tremors through global financial markets. 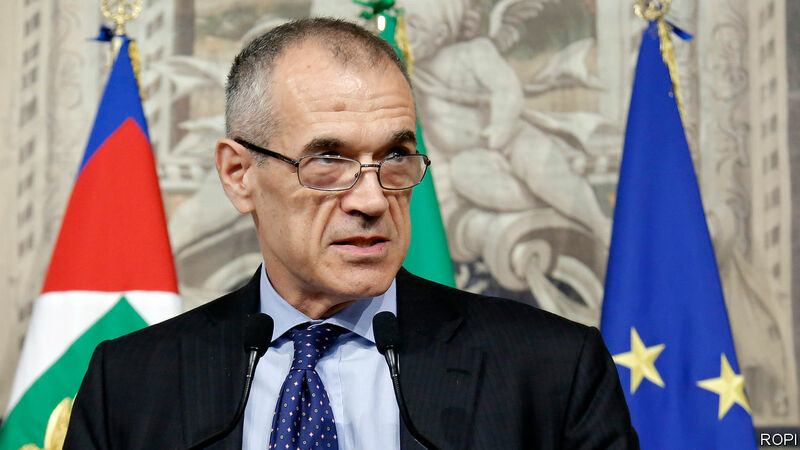 The president had originally planned to put a former IMF economist, Carlo Cottarelli, at the head of a government of technocrats, tasked with steering the country back to the polls after the summer. But Mr Mattarella was reportedly considering changing tack after meeting Mr Cottarelli on May 29th amid growing evidence of support in parliament for an earlier vote. Not a single big party has declared its readiness to back Mr Cottarelli’s proposed administration in a necessary vote of confidence. Mr Mattarella turned to the luckless economist after the last chance for a coalition—between the maverick Five Star Movement (M5S) and the hard-right Northern League—evaporated on May 27th. If the president had hoped that his choice of Mr Cottarella would reassure capital markets, he was swiftly disabused. Satisfaction with the blocking of what would have been Italy’s—and western Europe’s—first all-populist government since the end of the Second World War soon gave way to fears of an anti-establishment landslide at the forthcoming polls. The M5S and the League favour big spending increases and tax cuts which they claim will revive Italy’s sluggish economy. But their policies risk adding to its already large public debt (132% of GDP at the end of 2017). Fears in the secondary bond market have already begun to affect the primary market, increasing the cost of servicing Italy’s debts. On April 29th the Treasury in Rome managed to place 5.5bn of six-month bills, but at a rate of 1.213%—up from minus 0.421% at the last comparable auction on May 26th. The Milan bourse fell 5.8% from its close on May 25th and the euro fell to an 11-month low against the yen. The prospect of a Five Star-League government dissolved after Mr Mattarella refused to accept the two parties’ choice for finance minister: an 81-year-old Eurosceptic, Paolo Savona. The leader of the M5S, Luigi Di Maio, claimed afterwards they had proposed other names, prompting the president’s office to issue a rare, blunt denial. The issue is crucial: if Mr Di Maio is telling the truth, then it can reasonably be claimed, as the thwarted coalition partners have said, that the president was bent on scotching at all costs a government inimical to Brussels, Berlin and the bond market. Mr Mattarella’s choice of an IMF alumnus did little to quell such speculation. But if the president’s spokespeople are telling the truth, it suggests that the populist duo were less interested in Mr Savona than in forcing an early poll from which the League in particular stands to benefit. Mr Salvini refused to agree to one of his closest associates becoming finance minister instead. He has argued that he needed Mr Savona in the cabinet to show Italy’s partners that it was serious about demanding a reform of the euro zone, though he only brought the veteran economist into play late in the game. At all events, the stage is set for a critical struggle. In one camp stand mainstream politicians of the centre-right and centre-left. In the other are those that a former prime minister, Matteo Renzi, has dubbed i sfascisti: a play on words combining sfasciare (to wreck) and Fascisti (Fascists). The fairness of Mr Renzi’s characterisation will soon be tested against an ugly background of death threats against Mr Mattarella on social media. June 2nd is Republic Day. Mr Di Maio has called his followers to Rome for a mass protest against Mr Mattarella, whom he has said should be impeached. He has asked Five Star sympathisers elsewhere to hang out Italian flags to show their support. Mr Salvini has said the League had booked a thousand town squares to explain the aborted government’s programme, and will now use the bookings for protest rallies of its own. His behaviour does little to allay fears that Italy could become the Hungary of western Europe. He recently turned up at a high-profile soccer match wearing a jacket associated with the neo-fascist CasaPound movement. And demanding that the president set a date for the election, Mr Salvini added: “Otherwise we truly shall go to Rome.” He will certainly have known that this would be taken by many Italians as an allusion to an earlier constitutional crisis, in 1922, which Benito Mussolini’s fascists exploited to seize power by means of a “march on Rome”. Such talk in the present climate is wildly irresponsible. This month has seen the unexpected and extraordinary toppling of Najib Razak in Malaysia after a massive corruption scandal. Last month the Armenian prime minister was forced out by protesters demanding justice, the rule of law, and clean government. In the past 18 months, we have seen corruption issues upset governments and even lead to imprisonment for presidents in Peru, Romania, South Africa, Argentina, Brazil, Colombia, Guatemala, Israel and South Korea. Voters on every continent are fed up. Corruption is as old as politics itself, as are citizens’ efforts to root it out. But today anti-graft campaigners have new tools powered by technology. This phenomenon shows us the upside of mass data collection and social media, both of which are facing regulatory crackdowns and public scrutiny. The Open Government Partnership, an interstate compact created by eight countries in 2011, invites members to make anti-corruption commitments in broad categories that include measures to fight political, bureaucratic, private sector and cross-border wrongdoing. Changes to law enforcement can make the biggest difference as a fresh generation of prosecutors and judges drive investigations and convictions. Equally important, however, are public attitudes: fatalism versus resistance and activism. Communications scholars are well familiar with the phenomenon of a majority believing itself to be in the minority, or vice versa. A related concept is the “spiral of silence”.People fear isolation and tend to express their views only if they conform with the prevailing climate of opinion, at least within a particular group. This can affect election outcomes and opinion polling. But social media can be a useful antidote. Posts, likes and retweets are all things that tell ordinary citizens not only that their voices are being heard, but that their fellow citizens are marching alongside them. Think about the framing of the #MeToo movement as a statement of support to women brave enough to out themselves as victims of something often seen as shameful and even dangerous to admit. It is a message of solidarity and strength in numbers. We saw the same power of social media in the political uprisings that started in Moldova, the first “Twitter revolution” in April 2009, and was followed by the Iranian “Green revolution” a month later, through the upheavals of the Arab spring. Each harnessed the power of individuals realising they were not alone, and not in fact a minority but a majority, or at least a significant plurality. Scholars who focus on systemic corruption — including Raymond Fisman of Boston University and Miriam Golden of the University of California, Los Angeles — focus on how to shift from a corrupt equilibrium to a clean one. As they point out, residents of corrupt countries are certainly aware of the wrongdoing. But they are not aware of their fellow citizens’ determination to fight it. Quite the contrary; when corruption is systemic, it is rational even for individuals who would prefer to be honest to engage in wrongdoing so as not to avoid the “sucker’s pay-off”, in the language of game theory. Social media can shift that equilibrium one like and one share at a time. The example of how to confront systemic government corruption suggests that the best answers to other urgent problems — “fake news” and the deliberate dissemination of manipulative disinformation to disrupt democracy, for example — may not be to crack down on the perpetrators. Instead, we must show beleaguered citizens, who feel that they are at the mercy of political forces beyond their control, that they are in fact the majority. Turn the spiral of silence into a wave of affirmation. When European politics get volatile, eurozone banks feel the chill. 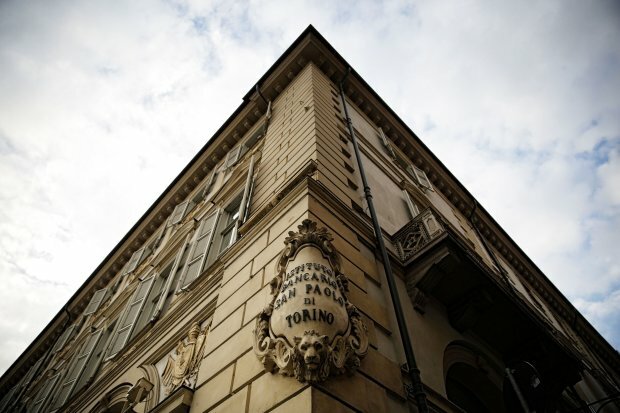 The collapse in Italy of attempts to form a populist government over the weekend led to a nasty sell-off in Italian government bonds and European bank stocks broadly on Monday and Tuesday. But even worse has been the reaction of investors in banks’ bonds. This matters because it feeds directly into the cost of funding for banks and the lending they can supply to the wider economy. One way to measure this reaction is in the cost of protecting banks’ debt against default in derivatives markets. This cost has shot up in recent days not only for Italian banks, but also banks in Spain, France and Germany. The cost of protection on the index of European bank debt--the iTraxx senior financials--was 20% higher on Tuesday morning, according to IHS Markit , a data provider. That is worse than the performance of bank stocks: the Stoxx Europe 600 Banks index lost about 3%, according to FactSet. 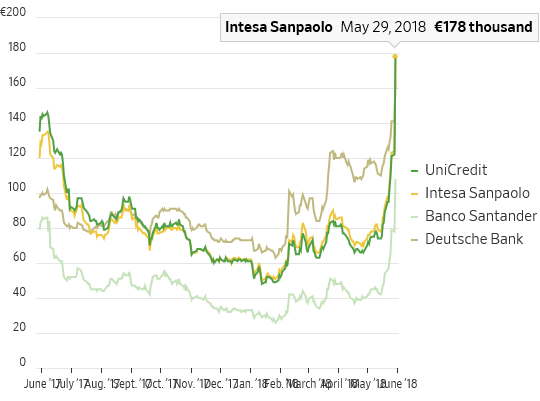 For UniCredit and Intesa Sanpaolo , Italy’s two biggest banks, the cost to protect against default has more than doubled in the past two weeks, according to IHS Markit, with the biggest rises coming Tuesday. Spain’s Banco Santander is enduring a similar ride. Among French banks, which saw a sharp spike in early trading, investors were likely looking for a cheap and readily tradable hedge against the extreme risk of a Eurozone breakup. With Italian and Spanish banks, which have been hardest hit, there are real risks on their balance sheets: a hefty exposure to their own government’s debt. As government bonds are sold and drop in value that is a hit to profits for these banks. It is also an unwelcome reminder of the “doom loop”, the vicious spiral of previous crises in which debt-laden eurozone governments both hurt national banks’ profitability and are too weak to stand behind them. In Italy, government bondholdings are nearly 11% of bank assets, in Spain they are more than 9%, while in France and Germany they are just 2.2% and 3.6% respectively. These figures from the European Central Bank cover all government bondholdings, but national domestic bonds tend to make up the vast majority of what banks own. Investors are fearful that banks once again get dragged down by political decision making that further weakens individual countries’ financial positions or threatens their membership of the euro. That would likely mean economic pain and rising bad loans. 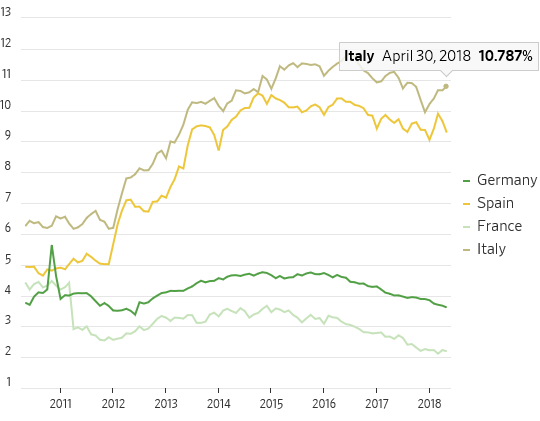 Italy is a long way from turning its back on the eurozone, but bank bond investors and shareholders aren’t ready to show its politicians much patience. Meanwhile, nearly half of Americans don’t have enough money to cover a surprise $400 expense. Many are living paycheck to paycheck, with little to no cushion. And US homes are less affordable than they’ve been in decades—possibly ever. In the meantime, a perfect storm of economic pressures will further hollow out the middle class. Tens of millions of Americans will be kicked down the ladder. 1. Owning hard assets like physical gold, silver, and certain real estate. 2. Owning the highest-quality, elite businesses. Think businesses with attractive dividend yields—even better if you buy these standouts at bargain prices. 3. Holding some speculative investments. They can leapfrog your wealth. Think transformative technologies like cryptocurrency and blockchain, the booming cannabis industry, and natural resource stocks. 4. Protecting what you’ve earned from taxation, inflation, and other forms of confiscation by internationalizing your assets. This reduces the threat any one particular government poses to your wealth.